Corticosteroids are one of the most frequently used drugs in dermatological practice. They are administered by different routes such as topical, oral, intravenous and intralesional. Intralesional route of administration provides advantage of achieving high concentration locally without systemic adverse effects. Local adverse effects noted following this route of administration include dermal atrophy, ulceration, localized calcification, etc. Occurrence of linear streaky hypopigmentation with atrophy due to uptake of the steroid crystals in the lymphatics has been reported previously. This condition is nonprogressive and tends to repigment on its own. This case report highlights the use of tacrolimus ointment for the treatment of this condition. 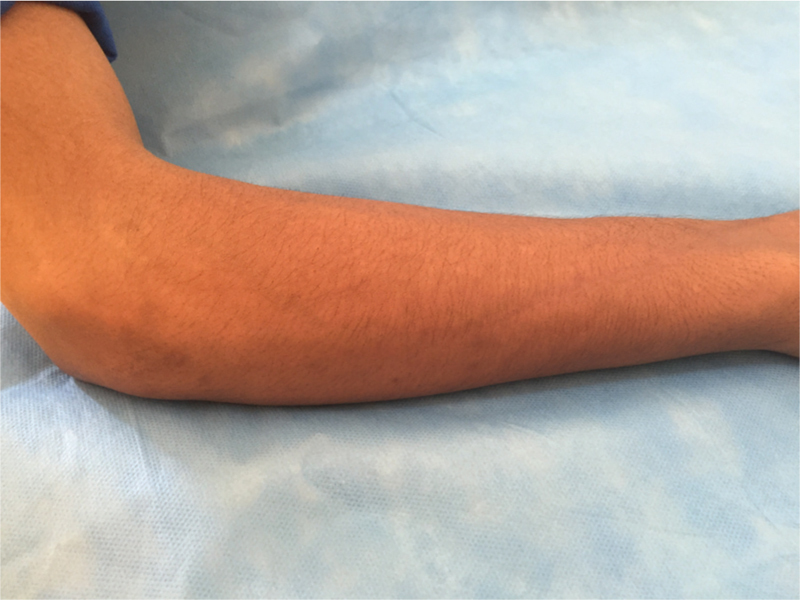 A 21-year-old male presented with complaints of asymptomatic swelling over right wrist joint for the past 3 months. For these complaints, this patient presented in the orthopedic department and was diagnosed as a case of ganglion. Following this, patient received single injection triamcinolone acetonide (40 mg/ml) intralesional. 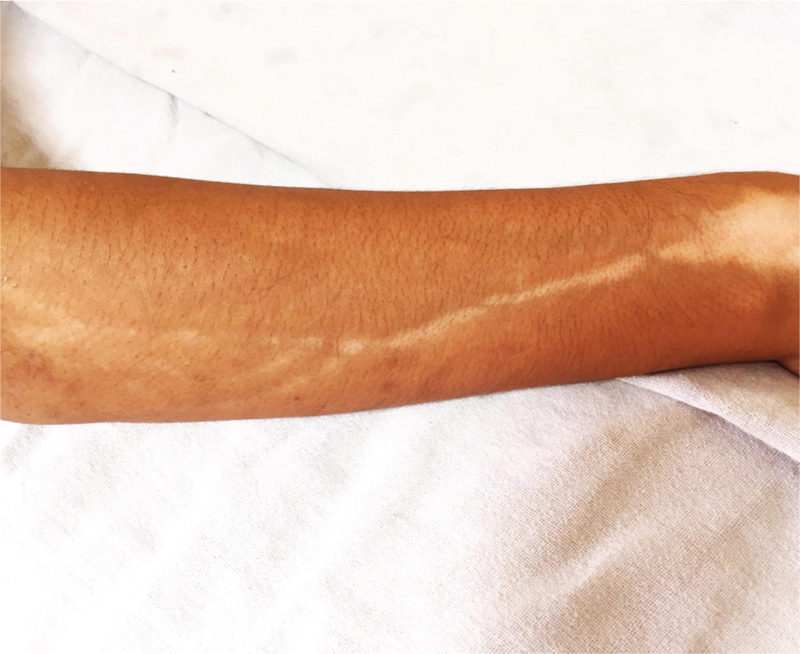 Two months following the treatment, the patient complained of linear hypopigmented streaks in the vicinity of the injection site [Figure 1]. The lesions were atrophic, asymptomatic, and nonprogressive. Muscle bulk and joint movements were within normal range. Neither numbness nor paresthesia was noted in the area. The skin was not indurated. Personal and family history of vitiligo was ruled out. On the basis of the clinical features and the preceding history of steroid injection, diagnosis of post steroid injection perilympatic hypopigmentation was made and the patient was started on tacrolimus 0.1% ointment twice daily. Twenty days following the treatment, the area repigmented completely [Figure 2], although dermal atrophy persisted. Skin depigmentation and atrophy following steroid injection have been reported previously in the cases of chalazion, hemangioma, keloid, etc., The pigmentary change radiates in a streaky pattern from the lesion. It may present following single or multiple injections. In a report of 886 cases of infantile hemangioma treated primarily with triamcinolone injection, depigmentation was noted in 10% cases. Other reports of same phenomenon following intra articular injections of rheumatoid arthritis have also been reported. Hypopigmentation following the steroid injection seem to be dependent on certain factors such as concentration and potency of the drug being injected. This phenomenon has been more commonly reported with triamcinolone compared to other steroids due to the intrinsic properties of the molecule such as higher tendency to aggregate, higher potency, larger size, and density. Injecting certain steroids in higher concentration causes more amount to be present in unbound state. Availability of more free steroids mediates the adverse effects. Repeated injections are also a risk factor. Triamcinolone is a potent steroid and is widely used intralesionally for the treatment of keloids, alopecia areata, ganglion, tenosynovitis, etc. It is the most commonly used steroid for intralesional injections due to its inherit properties namely stability at room temperature, easy resuspension, etc. Apart from perilesional hypopigmentation, other potential side effects of intralesional steroids include infection, ulceration, etc. The onset of depigmentation in other reports ranges from 2 weeks to several months following the injection. It may persist for more than a year and spontaneous complete repigmentation has also been reported. Studies have reported variable time for repigmentation ranging from 2 months to a year. Dark skinned individuals have a higher risk of developing depigmentation. This observation can also be due to the difficulty in appreciating hypopigmentation in fair individuals. Local lymphatic vessels are responsible for removing the macromolecules and proteins. Uptake of steroid crystals in the lymphatics explains the linear extension of these lesions. The steroid crystals cause localized lipolysis and depigmentation along the lymphatics. Kikuchi and Horikawa reported atrophy and depigmentation following triamcinolone injection for keloid in the upper arm. On injecting patent blue dye, staining of the lymphatics was noted. Skin biopsy revealed decreased melanin granules and sebaceous glands in the skin. Venkatesan and Fangman demonstrated that melanocytes remain intact in steroid-induced hypopigmentation, proposing that steroids may impair function of melanocytes. Steroid-induced inhibition of prostaglandin/cytokine production in the epidermal cells is hypothesized to cause melanocytes function suppression. Kaur and Thami emphasized the additive effect of hyalurnidase in facilitating uptake in lymphatic vessels by breaking the connective tissue.Tacrolimus is an immunomodulatory agent used extensively for repigmentation in vitiligo. It has been shown to promote migration of melanocytes and tyrosinase activation in the cells, thereby promoting repigmentation. Lan et al. reported that tacrolimus-induced proliferation of melanocytes by stimulating the surrounding keratinocytes. The repigmentation seen in the above case can be explained by the same mechanism of action. This case report highlights the potential adverse effects from intralesional steroid injection that should be kept in mind as well as factors which predispose to these side effects such as dark skinned individuals, potency and the concentration of the steroid used. Tacrolimus was shown to repigment the lesion completely and, thus, can be a potential therapeutic option. Hypopigmentation following steroid injection can be alarming for the patient and may be confused with vitiligo. Proper counseling of the patient is a must for this condition. Although spontaneous resolution has been reported, tacrolimus has been shown to hasten recovery in this case. Friedman SJ, Butler DF, Pittelkow MR. Perilesional linear atrophy and hypopigmentation after intralesional corticosteroid therapy. Report of two cases and review of the literature. J Am Acad Dermatol 1988;19:537-41. Kumar P, Adolph S. Hypopigmentation along subcutaneous veins following intrakeloid triamcinolone injection: A case report and review of literature. Burns 1998;24:487-8. Vazquez-Botet R, Reyes BA, Vazquez-Botet M. Sclerodermiform linear atrophy after the use of intralesional steroids for periorbital hemangiomas: A review of complications. J Pediatr Ophthalmol Strabismus 1989;26:124-7. Pandey A, Gangopadhyay AN, Gopal SC, Kumar V, Sharma SP, Gupta DK et al. Twenty years’ experience of steroids in infantile hemangioma − A developing country’s perspective. J Pediatr Surg 2009;44:688-94. Firooz A, Tehranchi-Nia Z, Ahmed AR. Benefits and risks of intralesional corticosteroid injection in the treatment of dermatological diseases. Clin Exp Dermatol 1995;20:363-70. Dhawan AK, Bisherwal K, Grover C, Tanveer N. Linear leucoderma following intralesional steroid: A report of three cases. J Cutan Aesthet Surg 2015;8:117-9. Kikuchi I, Horikawa S. Perilymphatic atrophy of the skin. A side effect of topical corticosteroid injection therapy. Arch Dermatol 1974;109:558-9. Venkatesan P, Fangman WL. Linear hypopigmentation and cutaneous atrophy following intra-articular steroid injections for de Quervain’s tendonitis. J Drugs Dermatol 2009;8:492–3. Kaur S, Thami GP. Intralesional corticosteroid induced perilesional and perilymphatic hypopigmentation. Indian J Dermatol Venereol Leprol 2002;68:356-7. Lan CC, Chen GS, Chiou MH, Wu CS, Chang CH, Yu HS. FK506 promotes melanocyte and melanoblast growth and creates a favourable milieu for cell migration via keratinocytes: Possible mechanisms of how tacrolimus ointment induces repigmentation in patients with vitiligo. Br J Dermatol 2005; 153:498-505.